It seems that after staring at only one side of the Moon for millennia, we now can’t get enough of looking at the unfamiliar sights on the far side. Amateur astronomers recently took a gorgeous picture of the far side of our satellite with Earth in the distant background, and, of course, the Chinese Space Agency historically landed a mission there in January to study it in even more detail. 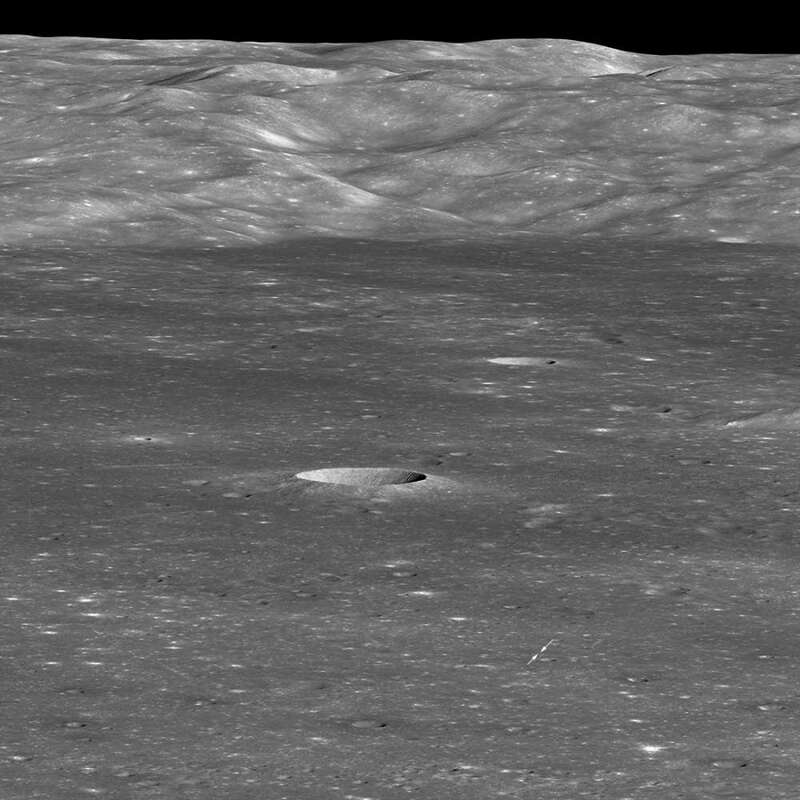 NASA’s Lunar Reconnaissance Orbiter (LRO) has created detailed maps of the far side of the Moon over its many years of service and it continues to keep a watchful eye on it. Its latest image released reveals it captured the first photo of the Chinese lander Chang’e-4 from orbit. Chang'e-4 is currently inside the large Von Kármán crater, which is 186 kilometer (116 miles) across. The crater is actually located within another crater, the South Pole-Aitken basin, spanning about 2,500 kilometers (1,600 miles) in diameter. The image was taken when the orbiter was 330 kilometers (205 miles) from the lander, and the NASA probe had to rotate 70 degrees to the west to capture the location. The tiny lander is just a 2-pixel-wide speck amongst the spectacular craters within the crater. One crater, in particular, pops out in this image. The crater at the center of the full picture (behind and a bit to the left of the lander) is 3.9 kilometers across (2.4 miles) and 0.6 kilometers (0.4 miles) deep. At the back of the image is the rim of the Von Kármán crater, which rises more than 3 kilometers (1.8 miles) over the floor of the where the lander and its companion rover, Yutu-2 (Jade Rabbit-2), are currently. Chang’e-4 landed on January 3. It was the first-ever probe soft-landing on the far side of the Moon. The choice of the Von Kármán crater as its landing site was for both scientific and symbolic reasons. American-Hungarian scientist Theodore von Kármán was the PhD advisor of Qian Xuesen, who later became the founder of the Chinese space program. Chang’e-4 and Yutu-2 are planning to determine the age and composition of the region, study cosmic rays on the far side of the Moon, and even carry out radio astronomical observations, while the Lunar Reconnaissance Orbiter is now entering its 10th year of operation. It was launched in June 2009 and has delivered some of the most incredible high-resolution images of our natural satellite.